Part 4. Bonus Strategy: How to Borrow Money from People Who Have No Money To Lend! Welcome back! Time for my 4th (and final) in this 4-part series. I truly hope what I’ve shared with you already has opened up a whole new way of thinking when it comes to structuring and presenting your deals to potential private money lenders. Remember, you’re offering private lenders a highly lucrative opportunity where they can put their money to work for them – an opportunity that beats any savings account, certificate of deposit returns and even stock market returns (and certainly in less time!). In Part 1 we covered loads of helpful information including how and why to think like a transaction engineer, the various financing options available, why private money makes the most sense for your residential real estate deals, and risk versus reward. Then in Parts 2 and 3, we walked through six scenarios on how to structure private money deals using my Rehab Valuator program. They included two Low LTV Debt scenarios, two Higher LTV Debt scenarios, a creative Debt and Equity scenario, and a ‘partnership-type’ Pure Equity scenario. First though, let’s briefly resync on the first six structures we’ve covered together, and the three scenarios each of these six structures fits under. Structure 1: Your lender funds 50% of both your acquisition and rehab costs. So in our example, your lender got 8% interest, and you ended up putting $74,240 of your own capital into the deal – that’s your half of the acquisition and rehab costs, plus all closing and holding costs. Your projected profit was $43,260, with a cash/cash return of 58.27% and annualized ROI of 116.54%. So a solid deal for sure, but it includes a large cash outlay for you, and thus a lower risk and lower return for your private lender. Structure 2: Your lender funds 100% of your acquisition, but not the rehab. In our example, your lender’s interest rate is still only 8% because this is still pretty darn low on the risk scale for him. Your projected profit in this structure was $42,000 (which is within around $1,000 bucks of the last scenario), but you’re only $43,990 out of pocket this time, which is over $30k less than you had to bring to the table in structure #1. And your cash-on-cash return has now more than doubled! Structure 3: Your lender funds everything with a straight interest rate. You’re only responsible for the closing and holding costs, and of course for making your monthly interest payments during the project, so your out-of-pocket cash goes down to only $8,480. Your projected profit of $40,520 is within $1,500 of the last scenario, but both your cash-on-cash (477.83%) and your annualized (955.66%) returns on this deal are now huge because you’re putting so little of your own money into it. Structure 4: Lender funds the whole deal (including rolling in closing and holding costs) and lets you defer any interest payment until after the property sells. So this deal ends up being $0 out of pocket for you. Your lender now wants a little more in return for letting you put off your interest payments, so the interest rate is now 10% instead of the 8% it was in previous structures. And while your project profit of $38,883 is nearly the same as before, your Cash on Cash Return and annualized ROI are now infinite, due to having none of your own money into the deal. Structure 5: We created a hybrid of debt and equity in which your lender funds everything, and you give them both (i) an interest payment and (ii) a cut of your end-profits in the deal. Just like our previous example (structure 4) your interest payments are completely deferred until the property is sold and the loan is paid off, so you’re still $0 out of pocket personally. 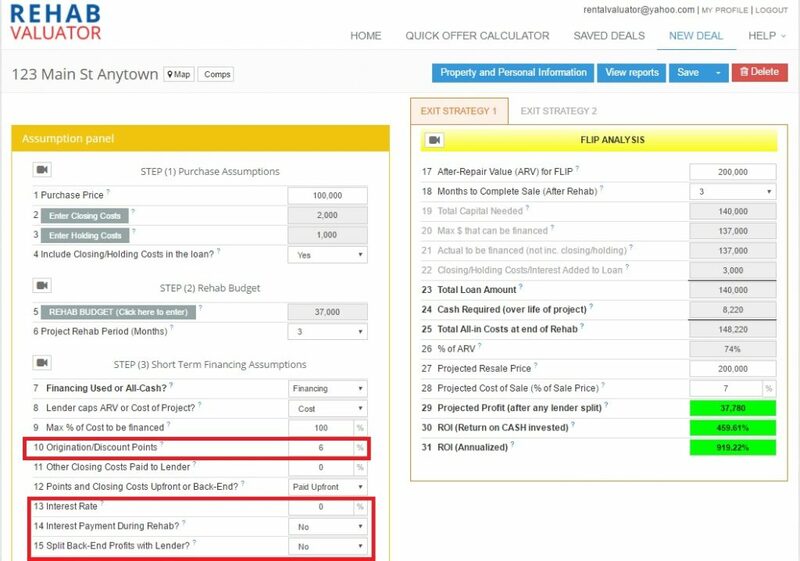 But the twist in our example was that you decreased their actual interest rate from 10% to only 4%, then increased their overall return by cutting them into the deal at a 25% cut of your end profits. 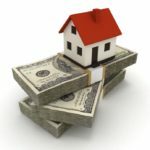 In this scenario, your projected post-split profits were lower at $32,391, but by cutting your private lender into the deal, you got the deal done and spread the risk out more between the two of you. Our sixth scenario is more like a single-deal partnership, but viable for sure and should definitely be counted in your arsenal of options to consider. Structure 6: Your lender funds everything with a 50/50 profit split. This is basically a joint-venture partnership. You and your lender/partner each stand to make a potential profit if $23,000 and your cash-on-cash return is still infinite, because you have none of your own money into the deal. You brought the deal itself, your expertise, and your time and effort to manage the project to completion, whereas your partner put up all the money, and you split the profits 50-50. So let’s step “outside the box” again and take a look at another creative way you can structure these deals with your private lender. We’re talking about how to borrow money from friends and family. Let’s start with their sources of cash. Just because a potential lender doesn’t have extra cash already tucked away somewhere doesn’t mean they have no way to tap into some cash. So let’s say he’s got no savings, no self-directed IRA, no ‘mattress money,’ or big bag of cash buried behind the wall… but does he own a home with some equity? If so, then chances are he has untapped borrowing potential from their equity. And with typically very low interest rates, this becomes very cheap money. For this strategy, I reach out to people who are very close to me, like family, close friends, and people who know and trust me. Typically, these loans have been for smaller amounts – $30k, $40k, or $50k each, but I’ve personally borrowed more than $100,000 just using this method in the past few years. Pay your private lender 4-6 points up front. Remember, each ‘point’ is simply 1% of the amount that they’re lending you, so if you’re borrowing $100k, you’re offering them $4,000 to $6,000 right up front. You also agree to make their monthly interest payments on their home equity line of credit until you repay the loan in full. Home equity lines of credit have notoriously very low interest rates, so this is actually some of the cheapest money you can borrow. So let’s think about this: You just created a lender from an unlikely source, and when you add up the up-front points and relatively small interest payments you’ll be making, your cost of money from an annualized basis is only around 10%, give or take. And your equity lender? Well, he’s happy as a clam because he just got to lend out somebody else’s money (the bank’s) to a trusted friend or family member, and made a nice chunk of up-front cash in the process. Now all he has to do is sit back and wait for you to write him a check back after your project is done, while letting you make his interest payments the whole time. But What If You Don’t Have the Up-Front Cash? Half of what makes this offer so appealing to your ‘friendly lender’ is that you’re paying them a few thousand bucks right up front – but what if you don’t have the cash lying around to do this? For example, let’s say they lend $50k out of their home equity line of credit. You offer them 6 points, which means you need to write them a check for $3,000 up front. But what if you don’t have $3k sitting around? Then simply write them a check for $3k out of the $50k. Just make sure you borrow enough from them to cover your entire project plus the points and interest payment you’ll be making, and you’ve got another sweet deal with zero dollars out of your own pocket. This is powerful stuff and it works really well! But it’s worth saying that I really only do this with people who know and trust me, and know that I’m good for the money. These people know me well and have no doubt that I’d bend over backwards to pay them back if a deal went south on me for some reason. Because of this, I’ve even done this type of structure without giving first liens and without promissory notes to my lender. They just write me a check with a verbal agreement, then I turn around and use that $50k or $60k for multiple deals. Now, it could be structured just like any other private lending transaction where you can give them the first lien on the property. It’s up to you really, but if you’ve got a solid relationship in place, then this can be a really phenomenal source of easy, inexpensive money for you. As you can see, you’ve got your lender financing 100% of the deal for you, and you’re paying him 6 points up front. So with that, your friendly lender can see he stands to make over $8k right up front, in exchange for letting you borrow from his line of credit. Now if you’re analyzing this deal for yourself and want to see what the actual cost of your money would be, then you can simply add in the interest rate his bank is charging for the line of credit. Then you’ll see exactly what your money cost is. 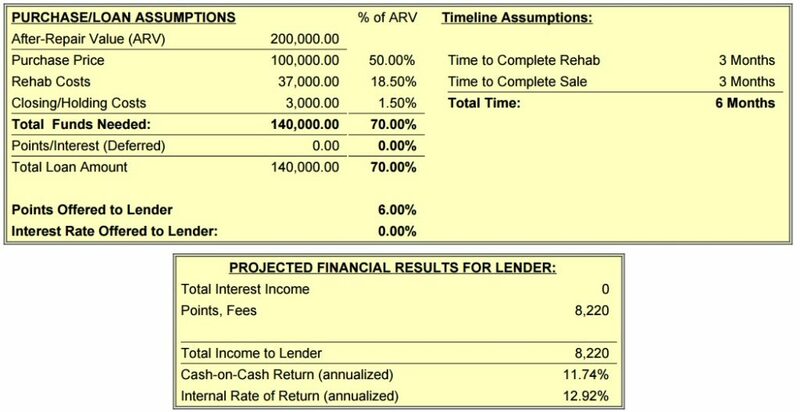 Rehab Valuator gives you the ability to put together a full, pro-level presentation for your lender. If you want to gain instant credibility and look like a total pro while doing it, then make sure you tap into this. For that last item – the Rehab Budget – you can do a lump sum or create a detailed scope of work to show your private lender, whatever you prefer. It also lets you choose if you want to ask for your rehab budget to be handled in draws, or to have the entire thing funded at closing. I built this to give you maximum flexibility with how you want to structure these deals with your private lender. Look, don’t just take my word for how much easier Rehab Valuator can make your life as an investor. I know I’ve shown you pretty solid examples of how user-friendly and helpful it is, but as the guy who built it, my opinion’s obviously a little biased. 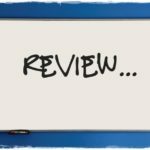 So let’s hear honestly from some people who have actually used it in the real estate investing business. Just to be clear, Margaret is using a different sector of our reports, specifically geared to creating marking materials targeted to your wholesale buyers as opposed to lenders. This is a whole different (but equally powerful) use I built into Rehab Valuator – but outside the scope of our topic here. These are just a few examples pulled from literally hundreds of honest testimonials that we’ve received from our clients all over the country who are using the software to help get their deals closed and funded. I really hope you got a ton out of this. If you’ve ever felt hesitant to approach private lenders because you weren’t sure how to best structure the deal with them, I’ve just handed you the keys to the castle. You now have the knowledge to craft a number of different scenarios, and the tools (in Rehab Valuator) to quickly crank out calculations and professional presentations that will get the deals done. So the next step is to setup your free Rehab Valuator Lite account and give it a test drive. Go ahead and see how easy it is for yourself! Great info as always, I highly appreciate all that you do with your products and services! Keep up the Great work.